When Natalie Maclean came out with Red, White and Drunk all over, I was still a naive noob in the world of wine. I read it, and then read it again, loving her picturesque descriptions of vineyards and interviews with the eccentric and lively folks behind some of the most iconic wines in the world. I promptly put her up on a pedestal and aimed to be a "real wine writer" like her some day. While the awkward "gawrsh-you're-SO-cool" idolization has since cooled off, my respect for and admiration of Natalie and her writing remains the same. So I was pretty stoked to attend the launch of her second book, Unquenchable. Play Food and Wine was packed wall-to-wall with Natalie's dedicated followers: sommelier students, wine critics, us blogger types, and people who just really like to drink. Four selections were available to try, in addition to a glass of cava on arrival. My fave of the night was the Catena Tilia 2009 Torrontes (Argentina): A fragrant, floral nose with a twist of lemon peel, its medium weight and silky texture were reminiscent of lanolin. Lingering, fruity finish with fresh acidity. It seemed to be the love/hate wine of the night; quaffers were either from one camp or the other. The Malivoire 2010 Gamay (Niagara) was all juicy black cherry, with a seam of dusty earthiness running underneath, enough to keep the flavours from bubble-gumming into a sugary syrup. I'm always amazed at the versatility of gamay, how winemakers can craft something serious and structured, or purely simple and fun. Natalie tells a great story, there's no doubt about it. When she stood up to the mic for a reading, the eclectic crowd buzzed in around her, lapping up each brief snippit from the book like thirsty pilgrims desperate for a drink. 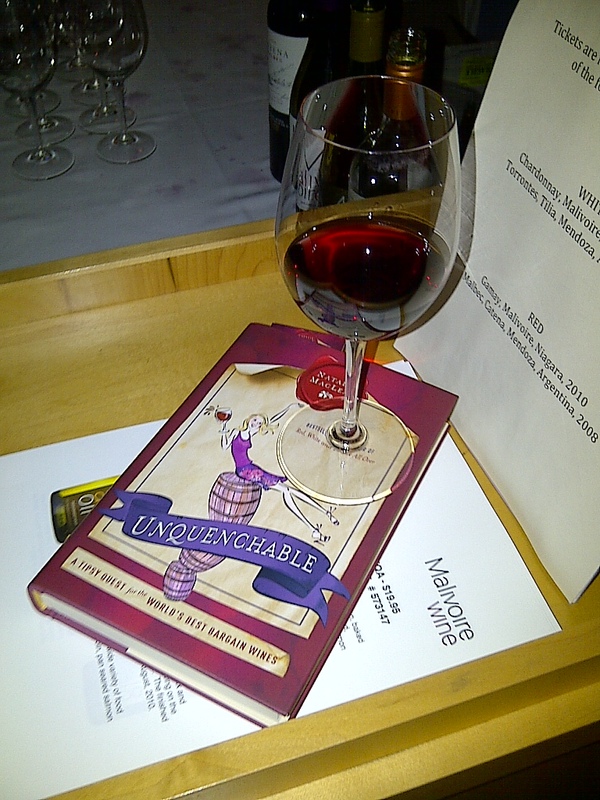 Her uproarious retelling of a meeting with Wolf Blass had us all in stitches: "This one I call the 'Leg Opener'. Naw, don't bloody well write that ..." she recites in an attempt to capture Blass' Aussie drawl. Then she did an informal show-of-hands poll on favourite Niagara wines and chatted up guests about wine and food travel. Pausing for breath, she seemed slightly overwhelmed for someone who's no stranger to celebrity status. "Wow, I still have your attention?" she asked, halfway through the reading. "The other group was already getting chatty by now. This is freaking me out a bit."